Hardcover, Linen with jacket, 608 pages, 19.3 x 26.5 cm, 7.6 x 10.4 in. During the Middle Ages, Europe developed far beyond the world of Classical Rome and Greece. Christians, Jews, and Muslims lived along side of one another in a multi-religious society. The dominance of monotheism over the polytheistic ancient world was the primary factor that made European culture possible. The author shows how the rise of the Christian occident has proceeded since the 12th century – and explains why other cultures have remained behind or followed other paths of development. It is the overall dominance of monotheism that distinguishes Europe from the pre-Christian Classical period and from the cultures of the Far East, and what first made the development of Europe possible starting Late Antiquity and on into the Medieval period. The expansion of the monotheistic religions and the cultures they formed presents a picture unimaginably colourful and vivid. If there is only one God, however, conflicts are unavoidable as a result of the expression of different religions’ conceptions of this Deity. Historically viewed, Europe is neither a geographic unity nor a society of shared values nor grandly spiritual culture. It has never reached “completion”, and has never had an indisputable identity. Borgolte’s benchmark historical work is astonishing contemporary. 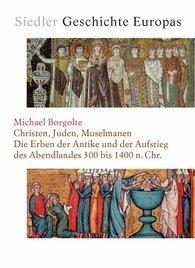 Those who would conceptualise beyond the boundaries of present-day Europe would be well served to know its prehistory – especially the relationships between Christians, Jews, and Muslims during the European Middle Ages.